Buying a used pop up camper can be tricky. On the one hand, you can save a lot of money buying used from a private seller. We got a screaming deal on our Coleman Santa Fe, and the best part is that we don’t have a monthly payment. That’s huge for us! On the other hand, though, owners can sometimes be less than honest about the camper they are selling. This means that you can often get saddled with a bigger project than you expected. That is why it is super important to make sure you thoroughly inspect your camper before you pull the trigger on that purchase. If you need more tips on buying a used camper, be sure to check out our guide here. Even when you do everything right, though, you can still find unexpected issues with your pop up camper. That is exactly what happened to Matt & Katie when they purchased their 2001 Jayco Quest 10x on Craigslist. They had been searching for a pop up for weeks, and everything in their area was getting snatched up too quickly. They kept seeing an ad for a Jayco camper that “needed work,” so they eventually decided to go take a look at it. At $500, they thought it was a good deal. After chatting with the owner and finding out what work was necessary, they felt confident taking it on. They knew they’d need to buy new canvas, which they’d priced out at Jayco for about $500 before they purchased they camper. Even with the new canvas cost considered, it was still way under their budget. They’d done their homework before going to see it and carefully inspected the camper for any red flags. It seemed structurally sound and ready for a minor cosmetic makeover. When they got their new camper home and started taking the old canvas down, Matt & Katie made an unwelcome discovery. There was rotten wood that extended throughout the entire roof. They hadn’t thought to look between the roof and the canvas, but once they removed the tenting, the rot was obvious. Now they had a huge project on their hands, but undeterred by the scope of a roof rebuild, they dug in their heels and got to work. 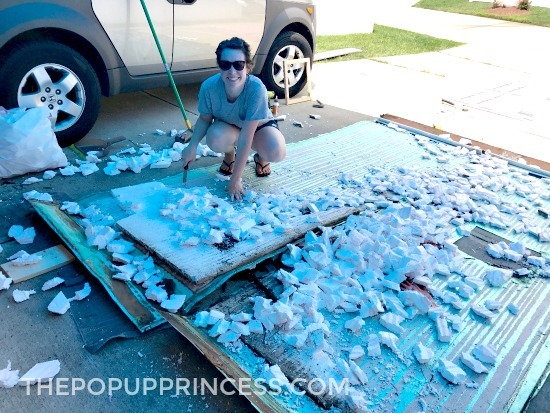 Matt removed the roof and Katie scraped off the old foam from the inside for hours. It was actually still wet from old water damage. Katie was surprised at how simple the construction of their PUP roof was. She says it was basically a thin wood frame, and 1-inch insulation foam, and a sheet aluminum skin adhered to the top. 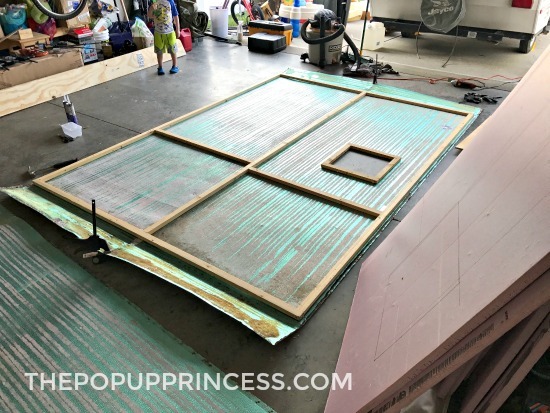 Once they had the foam insulation removed, Matt built a new roof frame, bought replacement foam insulation, and began the process of reattaching the aluminum skin. With the new roof complete, Matt and Katie knew they had to thoroughly examine the body of the camper to see if it was solid. Sadly, it was not. They found water damage to the body panels and subfloor of the camper upon closer inspection. Matt had to rebuild part of the front end and replace a section of the subfloor before they could go any further with the remodel. 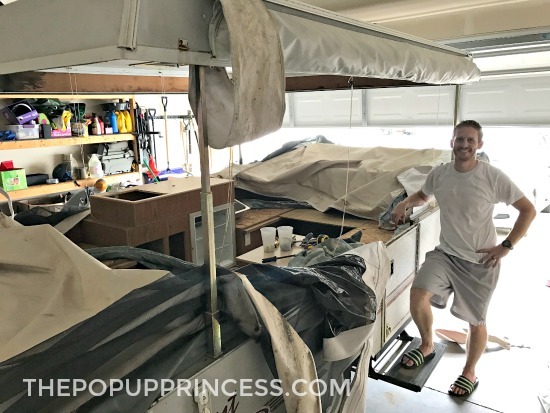 It was a lot of work, but with their pop up finally structurally sound, Katie and Matt were able to start painting the interior. 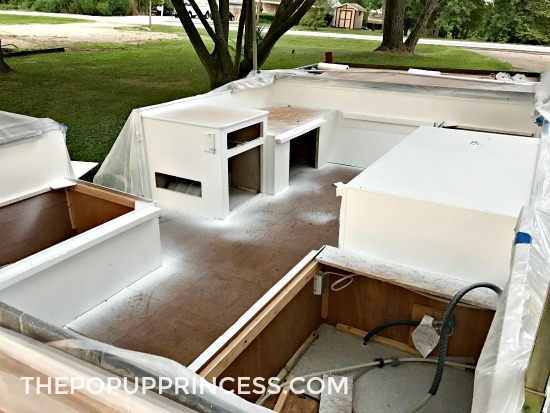 It was actually convenient that the roof and canvas were removed, because it made painting the cabinets with a spray gun really easy. Silver linings! 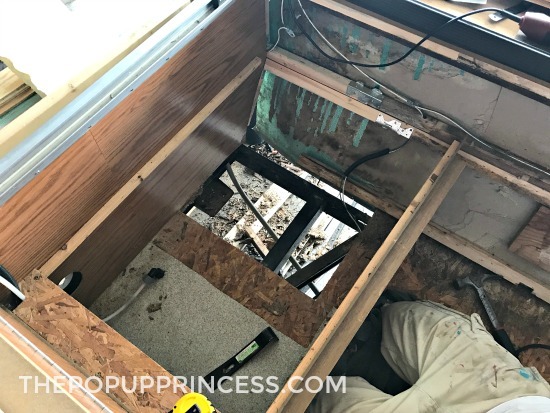 😆 After working on structural issues for so long, it was exciting for Matt and Katie to see some of their projects making such a difference in the appearance of the camper. They painted all the cabinetry white and replaced the hardware. 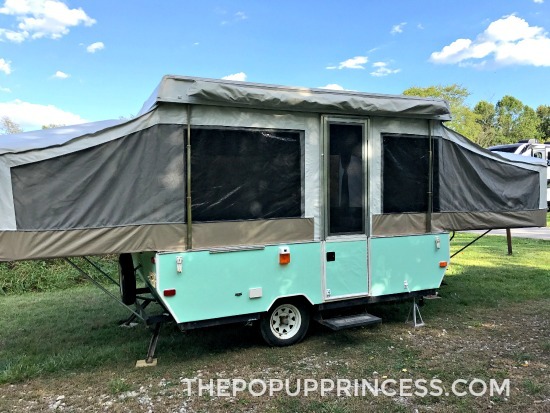 It completely transformed their little Jayco. They had to paint the roof due to the rebuild, and they replaced the exterior hatches and vents as well. Matt decided to paint the body of the camper while they were at it. Inspired by retro VW camper vans, they selected a Behr Premium exterior paint in the color “Free Spirit.” Fitting, right? 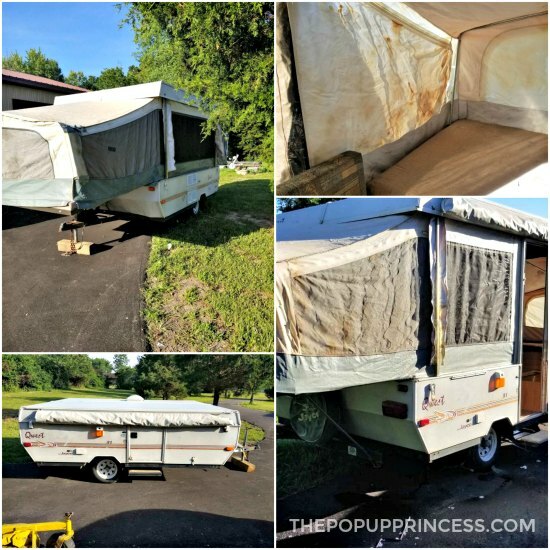 Matt used rollers and brushes to paint the body of the camper, and Katie reports that nearly a year later, it is still holding up beautifully. 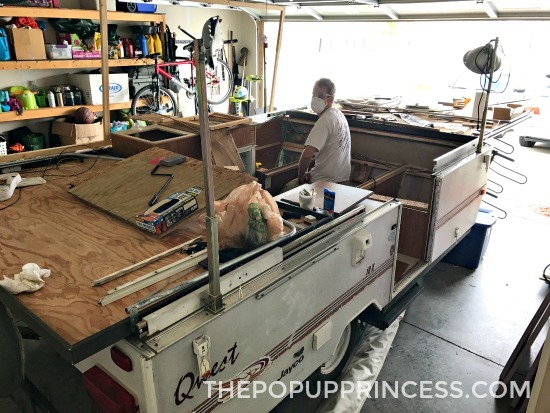 While Matt was working on the structure of the camper, Katie took on the cleaning and planning. She scrubbed and cleaned everything while it was dismantled–the door, the vent, the cushions, and the mattresses. The foam was actually in pretty great shape, so Katie just gave it a good cleaning and started looking at upholstery options. 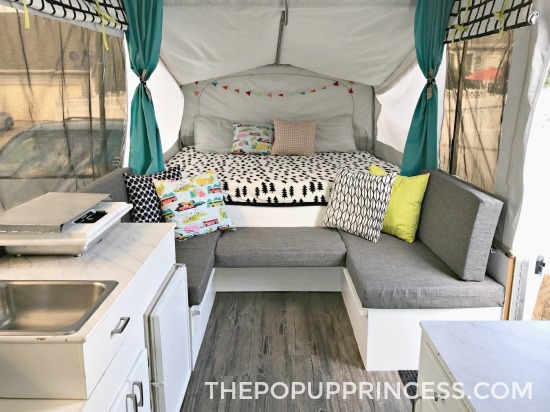 She also began choosing a fun color scheme for their little camper, which they named Poppy. 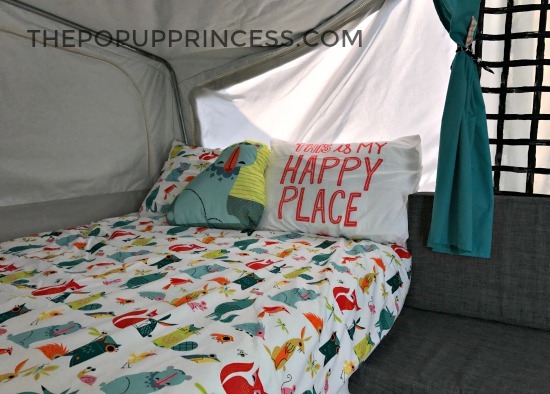 The kids’ bedding from IKEA actually inspired the entire color scheme of the camper. Katie really wanted the cushion covers to have removable covers, but didn’t want to deal with sewing in zippers. To achieve the perfect cushion slipcover, Katie made envelope-style covers and squared off the ends using this tutorial from Confessions of a Serial DIYer. Katie was able to salvage most of the original curtain tabs and sewed them onto hemmed flat sheets for the bunk end drapes. For the side curtain panels, she used inexpensive IKEA fabric to sew a shade. The fabric was perfect, because it was extra wide and fit the windows easily. She sewed the original curtain tabs to the patterned fabric and added ties at the top. This enables her to roll up her shades when she wants to open up the windows or needs to fold up the camper. The best part of these roll-away shades? No wrinkled curtains when she opens up the camper. Great idea! 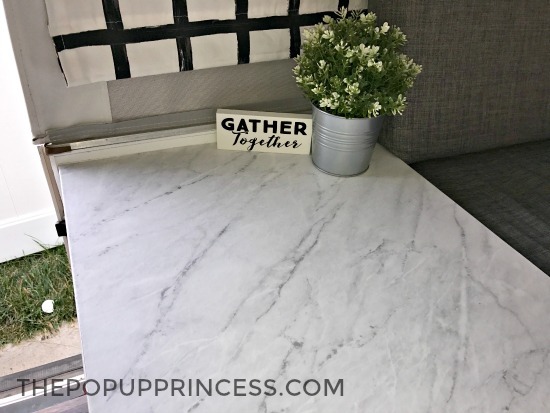 Katie applied a gorgeous marbled adhesive paper to the countertops. It’s durable and looks amazing. You can find that product on Amazon here. She initially painted the t-molding around the countertops, but it didn’t hold up very well. It began to chip and crack. Katie ended up replacing the painted trim with new, white t-molding, which you can also find on Amazon here. When Matt was repairing the subfloor, they knew the old, outdated floor would need to be replaced. They selected a gray adhesive-backed plank vinyl from Home Depot to replace it. Because they didn’t have much square footage to cover, they only needed one box. It ended up being a really economical fix that totally changed the look of the space. To complete the remodel, Matt build a new table for the dinette. Katie loved the look of wood planks, so Matt constructed a plank table which he reinforced from the bottom with metal brackets. Now there is no problem using this table top as a bed support, and it makes a great statement piece when it is set up. 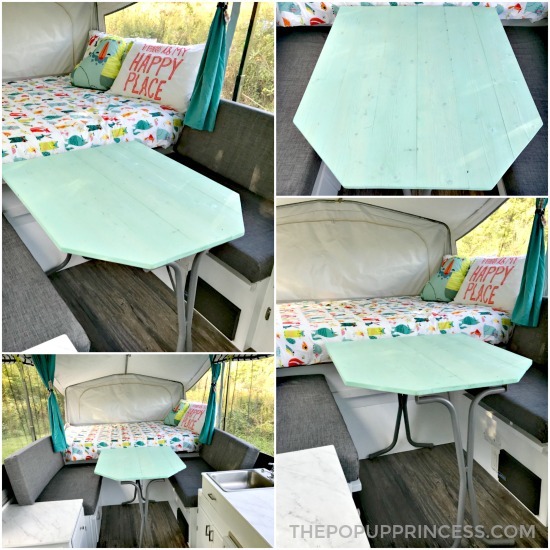 They watered down the exterior paint they used on the outside of the camper and gave the table a color wash so they could still see the woodgrain. The original legs got a coat of spray paint, and the makeover was complete. 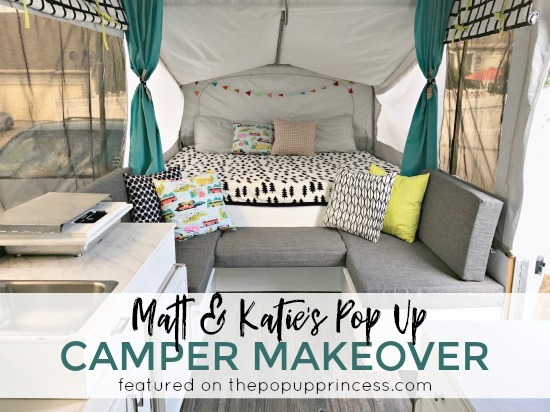 Matt and Katie had spent the summer working on their camper, so as soon as it was finished, they took a few Fall camping trips. Katie says it was wonderful, and they had an amazing time as a family. They ironed out all the kinks and have started gathering gear for this year. In fact, they already have their 2018 camping season planned, with a trip to the beach coming up soon. 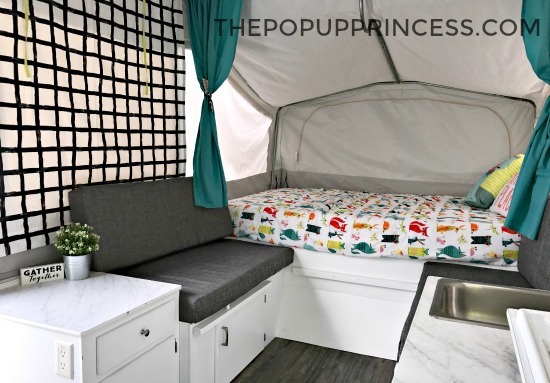 This is the pefect camper remodel idea for us, one question, did she added weight to the bottom of curtains? Do you remember the flooring color name! I love how it turned out. Y’all did a beautiful job!!! I love the idea of the Roll up curtains but could you tell me a little more so I can use your wonderful idea and design? Yes, please, share more on roll-up curtains. I’m at the curtains phase of our remodel and love this idea. Can you tell me where she purchased the new vinyl for the pop-up? I believe she’s referring to the new flooring, it’s beautiful! Do you happen to know the color? Btw, I just stumbled upon your website, we just bought a 2001 Coleman Sedona last night, same floor plan as yours! 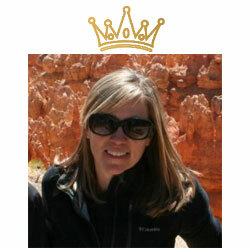 We also have 3 kiddos (3 teens), so I can relate to many of your organization posts! Here’s to remodeling and making it our own!!! I would love to know how the roll up curtains were attached, they look great. Also, is this the regular floor plan? We just moved our floor plan around and it has made such the difference having the U shape. We love it. I also want to know more about the roll-up curtains and also where she got the black and white blanket with the tree pattern. I love the gray fabric used on the dinette seats! About the exact color and texture I am looking for!